What’s Iconic Syracuse? It’s an Al Dente series tracing the faces, dishes, drinks, and foods that create the fabric of the Salt City’s food culture. Are these the best in town? Not necessarily. But, they are the icons of our food community. After all, this place is more than just the home of salt potatoes. 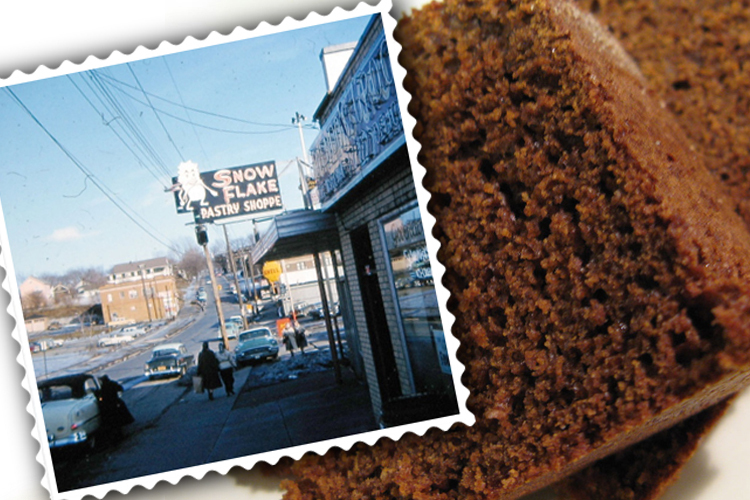 These are the Iconic Syracuse desserts. Next Thursday, we’ll tackle the foods. Follow the series here. Everyone has an opinion of dessert. Me? I like chocolate chip cookies or ice cream, but otherwise I’m not a big sweets person. I’ll have some M&M’s from time to time, but I would rather eat another dozen oysters or drink another beer then eat dessert. This leaves me in a very small minority of people. Harrison Bakery Halfmoon Cookie: Happiness is a Harrison Bakery chocolate chip cookie. Bliss is a Harrison Bakery halfmoon. You cannot find a fluffier, moister cookie in town. Our fellow New Yorkers that live south of the Tappan Zee do not want hear this, but the best black and white cookies are made in Upstate at the little bakery across from the Basilica of the Sacred Heart. The Harrison Bakery started out on Harrison Street in Syracuse before moving to West Genesee Street in the 1960s. When I was a kid, I thought that their diagonal automatic doors for entry and exit were the coolest thing. Anyhow, they may be the only bakery left in town that has the rolls of string hanging from the ceiling. I’m a fool for nostalgia and a good cookie. Villa Pizze Fritte: Fried dough is only good when purchased from the Villa booth at the New York State Fair. And, for a Fair-hater like myself, it’s the only thing I ask The Wife to bring me home each year. Three-foot lengths of dough are fried, heavily sugared and served in wax paper bags. It could be a record crowd with record heat and humidity, and lines will still form for the molten hot dough. Villa used to have stores in local malls. The last one I remember was from the mid- to late-1990s at Carousel/DestinyUSA, but this is a treat best enjoyed on the midway. Gannon’s Ice Cream: There’s no one flavor that stands out on a visit to Gannon’s Ice Cream because they are all amazingly fantastic. You really can’t go wrong. For instance, I detest walnuts, but I will go headfirst into the carton of dark chocolate walnut. Better than the ice cream is that a trip to Gannon’s in The Valley is socioeconomic cross-section of Syracuse. Middle class families, kids playing Little League at the nearby park, families who have nothing, families that have everything…the parking lot at Gannon’s during the summer is where they intersect. I’ve seen BMWs parked next to rusted minivans that may not make it home parked next to Harleys. It’s quite a beautiful thing really. Yes, the Snowflake has been gone for…forever. But, their halfmoons aside, it’s this towering white cake topped with strawberries that brought my family in. There are few things that could get the Italians from the North and West sides to drive across town and into a lousy part of the city. This cake did it. According to fellow eater Margaret McCormick over at Eat First, one of the Snowflake’s former employees has brought the cake back to life at the Pastry Palace in Jamesville. Christmastime is fun at our office, if only because vendors always send food. We get a ton of candy at our office shipped from all sorts of gift catalogs. But, when the Chocolate Pizza arrives, it’s a stampede. That thing is consumed with lightning quickness. The company is a real testament to entrepreneurship. Founded as a side business of a flower and gift shop in Marcellus, the Chocolate Pizza Company quickly gained popularity and was spun off into a standalone business. The original owner retired and sold to one of her customers, who has expanded the brand’s reach locally and nationally. Have you ever seen candy canes being made? It’s the strangest process that always makes me think of Aquafresh toothpaste. Anyhow, you can find candy canes anywhere at the holidays, but it’s tough to find those that are rolled by hand. For that, you have to head to East Syracuse where Hercules Candy Company rolls their holiday confections by hand. Go on one of their November open house days and you can watch the candy being made in person. The little candy shop on the corner of Court and Lodi was founded in the 1920s by Italian immigrants. For nearly 100 years, the family-owned candymaker has manufactured its own chocolate and fudge from the kitchen in the same building as its retail shop. The chocolates are fine, but if you are going to Speach’s you would be silly not to buy their chocolate covered potato chips. The concept is simple, but hardly-ever replicated. The Iconic Syracuse potato chip maker Terrell’s supplies the ridged chips, which get a bath in milk chocolate and dry out on pans. They’re salty. They’re sweet. They’re iconic. Previous articlePublic Transportation: Brew Bus Brewing Are Wheat There Yet?